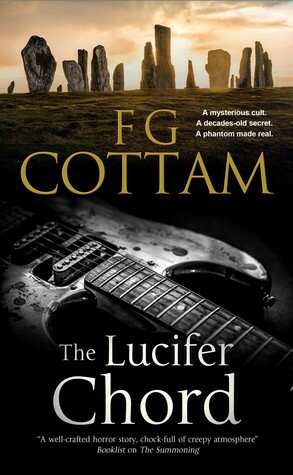 THE LUCIFER CHORD BY Francis Cottam is out NOW! It is so nice to have Ruthie and company back for a visit. Ruthie has been commissioned to do an essay on Martin Mear and his band, Ghost Legion, as part of a new boxed set and a tour of his music and memorabilia. But something isn’t right about any of this, she discovers as supernatural events force a medium to run for her life and more me she knows to end up dead. Ruthie is no stranger to the supernatural or the occult forces in the world. She has come up against them before and lived to tell the tale, but will the third time be her last? Ruthie is one of my favorite characters and I hope we will see more of her! Cottam’s writing draws you into the story and the characters and before you know it you are almost finished, so you slow down to make it last and still end up hurtling towards the end to find out what happens! As a great coincidence I had a text from a friend who is at this minute on the Isle of Wight so this seemed a sign of sorts, but by then I had devoured the entire book! If you like secret societies, the occult, fact with fiction mixed in and a spooky setting,then you should read the books before this one as well. OH FRIDAY, I THOUGHT YOU WOULD NEVER GET HERE! A spooky paranormal with a rock star who may or may not be dead! I am a big fan of the author!